Loving Vincent | Exploring the mind of a master through his own eyes. "Is a film even a film if it hasn't been discussed on this podcast? " Another indeterminate amount of time, another amazing podcast episode. Vincent Van Gogh. Ever heard of him? The answer is yes, because Vincent Van Gogh is famous and he’s the sort of famous person whose fame is eternal, unlike people like Carrot Top or Pauly Shore. Van Gogh was a Dutch painter who was one of the most famous and influential figures in the history of art. Even if your knowledge of art, art culture and art history is as limited as Jamie Kennedy’s talent, you almost certainly know Van Gogh’s name. You also probably vaguely know him as the artist that cut off his ear. That’s him. Ol’ No Ear Very Talented Guts, as we’ve always liked to call him as of ten seconds ago. Loving Vincent isn’t the first biopic to focus on Vincent Van Gogh, but it is the first Vincent Van Gogh biopic that has been discussed on The ReelGood Podcast, which sort of makes it the only Vincent Van Gogh biopic that’s worth your time. Is a film even a film if it hasn’t been discussed on this podcast? We’d normally let you be the judge, but when the answer is clearly no, it’s best that we do the answering for you. 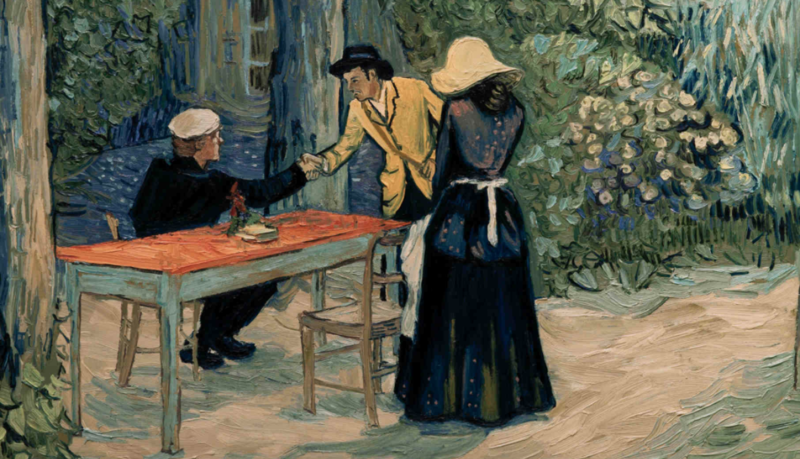 Loving Vincent is ALSO the world’s first fully painted animation feature. If you don’t know what that means, you should go and check the film out ASAP and see just how incredible a thing that is. If you do know what that means, still go and see it, because it’s an incredible thing.